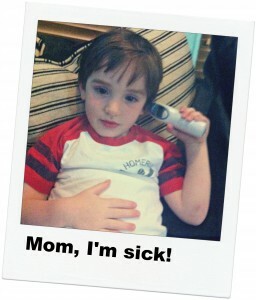 Have you ever noticed that one of your children is about to get sick and you do nothing? And not because you don’t love your children. But if you take ANOTHER day off work to take them to the doctor it means you will miss a meeting. Balancing sick children and your job is a challenge. Period. We working moms are always trying to do what is right for our kids and our employers. But if you take your son to the doctor, you won’t finish that project on time another month in a row and you aren’t sure your boss will be so understanding this go round. Or, maybe you are hourly and you just can’t afford to take the time off work. It’s as though you are buying time until the inevitable… several days off in a row because your child is now too sick to go to daycare. As working moms, we have to be conscious of the needs of both our children and our jobs. There is nothing worse than feeling as though you are torn between doing the best thing for you child and securing their future (and yours) by being the best employee you can. The truth is, we can’t do it all. Sometimes we have to choose who needs us more and try to see into the future when it comes to our children’s health. Will this stuffy nose turn into an ear infection? Is this diaper rash going to go away with over the counter medicines? Is my kid just teething or could he have a bug? I have 3 kids. When one gets sick you can pretty much guarantee that the other 2 are going to get it as well. And I can be the worst about waiting because I feel guilty for taking off work. Plus, I’m not sure if you have ever taken 3 small children to the Dr at the same time. Murphy’s Law always applies. The Dr is running behind because of an emergency. The only room that is available is the size of a broom closet. One, if not both twins are going to poop in this room and essentially gas you and the nurse out. Like we say in Texas, it ain’t gonna be pretty. So when I was approached by U-Haul to take a look at their Kids Program, I was pretty excited. I truly believe that a company is well-served to make the life of a working parent easier by providing resources, PTO and some flexibility. Their retention is higher, more qualified individuals are attracted to a family friendly company, and their employees will perform at a higher level because they aren’t as stressed. It seems that U-haul has figured this out. U-Haul Kids Program hits the mark by providing an exciting resource to the children of it’s employees. They have partnered with MDLive which provides 24/7 access to certified physicians online via phone or webcam. Yes, you read that right. 24/7 access to REAL physicians – including pediatricians. No copay, no fee for the appointment. These physicians will diagnose and write prescriptions (if needed) for routine medical conditions. Don’t think it is serious enough for a physician to see your child but just want some guidance? They have a 24 hour Nurse-on-Call feature to help you determine if there are home remedies or if you do need to see one of their physicians. And get this, if they do prescribe a medication you can pick it up from a CVS/Caremark for FREE. I did not stutter, I did not use the word FREE just to draw your eyes here. I am writing the truth. You can pick up your prescription for FREE. Gratis. And as if all of that isn’t enough, they are providing this service to both their part-time and full-time employees. And the employees don’t have to carry their health insurance. And the children don’t even have to be their own. If you work for U-Haul and you take care of a child under 12 years of age, you can sign that child up for this service. You no longer have to miss work to treat a simple case of pink eye, a rash, sore throat, etc. And if the symptoms develop after your Dr’s office hours, you don’t have to wait until the morning or go to an urgent care clinic. You can take care of your sick child immediately and you don’t have to let it get to the point that you are missing several days of work. I am so excited for their employees and I don’t even work there! As always, I love to hear from you. Tell me what sounds appealing to you about the U-Haul Kids Program. Is it the flexibility? The no copay on “visits” and prescriptions? The technology behind it? Let me know! I love a good conversation. Does this make you want to consider a career with U-Haul? Have you been thinking about re-entering the workforce and wanted to find a family friendly company? Check out their jobs page here! And don’t forget that full-time and part-time employees are eligible for coverage through this program. Disclaimer: I will be writing about and reviewing their program over the next 6 months. Don’t worry. I will tell you the truth. But in exchange for my thoughts and time, U-Haul is providing me with access to their Kids Program. And frankly, I’m not sure who is getting the better end of the deal. My kids get sick. A lot. Sounds like a smart program for the employee and the employer! It always makes me angry to see “family friendly” businesses that don’t make any accommodation for working parents. I agree. I think they are doing a world of good for themselves and their employees. I wish we could offer something like this to our employees. You have been fortunate! We really have too though – it’s just that it goes through the whole family like wildfire. I like the nurse-on-call feature. I think it’s a good idea to go ahead and ask someone who may have knowledge of what you can do before getting a prescription or giving your child medications. I’m so glad you have access to this and hope you never have to use it. Thanks for chiming in! So my aunt wrote this post and she is brilliant! Not to mention my cousin is adorable! For all you moms out there that need a nanny or babysitter, please trust me and go to http://www.NannyCare.com. I found a great nanny on this site the same day. It will save you tons of time and money! When I first started my business I was working 24/7 and really needed help with my children so that I could focus and get my company off the ground. I was able to find an experienced, reliable, local nanny in my budget quickly! I actually used this site and it was great! Very challenging. I only have 1 son but my husband has no paid time off from work. The sole responsibility falls on me. My father and step-mother helped in the past but now have their own health issues. My employer has something similar but how do you diagnose ear or other infections this way? I dropped my baby off at daycare this morning with a sinking pit in my stomach. He’d been teething, runny nose, coughing and batting at his ears. We were both up half the night and Daddy works 200 miles away this summer. It may not have been “serious” illness but my baby needed me and I needs him too! Needless to say I got to work and promplty broke down into sleep deprived hysterics. They are always understanding and . Let me leave for the day. After a trip to the walk-in he has a mild viral infection and lots of teething….now I get to dread the pile of work waiting for me tomorrow. Some days I absolutely feel torn….am I a good employee? Am I not? How does it effect the kind of Mother I am and what does it cost my son? I had written this lovely response to you, Alicia, and I left my desk and came back to closed windows. Boo! I think when you are using something like U-Haul’s MDLive you have to pick when to use it. I recently used it for a persistent diaper rash (post to come tomorrow) and had a wonderful experience. But I wouldn’t have used it for something like an ear infection in my younger son who has had them chronically – it’s something I would want someone to take cytology on or to look at the history of antibiotics. Same goes for a very young child you can’t communicate well where it hurts. But in that instance I might call them in desperation to ask the nurse for tips on soothing the infection until I could get to my regular pediatrician. Check out the topics section of the blog on the right hand side and look at the topic “Work Life Balance” It has some great tips and some humor. Also, realize that even if you stayed at home there would be something you would questions yourself about. As humans we are always going to question if what we are doing is the right thing. But in your son’s eyes, you will always be #1. Pingback: Honesty, reflection, perception: “Mom”ing is hard – Mommy B, That's me!